Home :: GREETING CARDS :: Fab Florals (4 styles) :: Blue Floral Pop Happy Birthday! 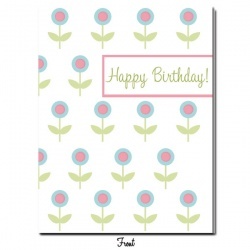 Send off your birthday greetings with our Floral Pop Happy Birthday greeting card. Show them how special they truly are! Other Info: Professionally printed on 100 lb smooth ivory paper. Each card measures 4.25" X 5.5".